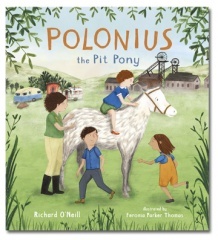 When Polonius the pit pony escapes from the coal mine hes worked in all his life, he joins a family of Travellers. Although he enjoys the freedom and the fresh air that their lifestyle offers, he wishes he could give something back to the family in return. When the chance arrives for him to do something to help, he rises to the challenge, and uses his intelligence and skills to save the day. Based on true events and retold by a master of the oral tradition, this story bears witness to the Traveller values of independence, initiative, courage and hard work. Richard ONeill was born and brought up in a large traditional Romani family in the North of England. He is an award-winning storyteller and writer who tells his original stories in schools, museums, libraries and theatres throughout the UK. A sixth generation storyteller, he grew up in a vigorous oral storytelling tradition, learning his skills from some of the best Travelling storytellers in England, Scotland, Ireland and Wales. Richard is the author of eleven childrens books, and his stories and plays have been broadcast on BBC Radio. His digital stories have been enjoyed throughout the world, and in 2013, he was the recipient of the National Literacy Hero award. Feronia Parker Thomas was born and raised in the South West of England. Her first love was drawing, and she spent many hours as a child writing and illustrating her own books. In 2007, Feronia moved to London to study Illustration at Camberwell College of Art. After graduation she trained as an art teacher, but decided after teaching for a while that illustrating full-time was much more enjoyable. It was the best decision she ever made! Feronia lives with her family in Bristol, England. When she isnt illustrating, you can find her walking, or growing vegetables in the garden.